We're dedicated to partnering with the best makers in Oregon. We team up with companies that share our focus on quality, efficacy, craft and sustainability. Luminous Botanicals creates the renowned Universal Cannabis Tonic, a full-spectrum elixir relied upon by many. Our CBD-rich cultivars inform the Earth and Meadow blends, which can be used orally, topically or sensually. 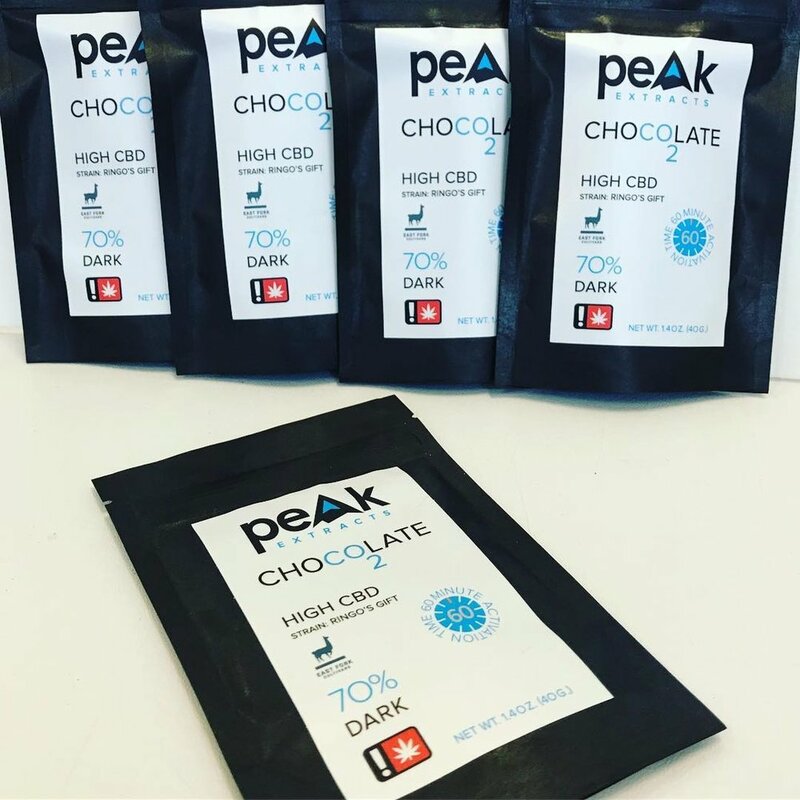 Peak Extracts concocts single-strain chocolate bars and vaporizer cartridges. Each formulation is rigorously tested for effects by the in-house quality control team to ensure a consistent, potent experience. Quill is a sleek, all-in-one oil vaporizer. We team up on a CBD-rich option that's easy to use for discreet micro-dosing when you need a little energy boost. Empower BodyCare crafts a full line of cannabis-infused products designed to be used topically, in the bath, and even in the bedroom. Empower offers a simple instruction with all that they make: "Put it where it hurts." We've teamed up with Astronoma to produce a line of single-origin, full-spectrum cannabis oil. Available in three CBD:THC ratios, all cannabis used for the line comes solely from East Fork. O.penVAPE's meticulous, small-batch extraction process using supercritical CO2 results in some of the tastiest vaporizer cartridges available. Look for limited, strain-specific releases. Toro Ma crafts a line of potent, single-strain chocolate bars. Toro's products have long been lauded for their nuanced, reliable effects and commitment to quality ingredients. Toko is a line of vaporizer cartridges crafted by the seasoned lab team at Sweet Cannabis. Toko excels with top-shelf technology and consistently pleasing oils free of hydrocarbons or other solvents. Müru makes a line of tasty, versatile "cannamixer" syrups designed to stoke inspiration of the mixologist in all of us. Syrups feature full-spectrum oil and come in multiple flavors and CBD:THC ratios. Pax makes a diverse line of vaporizer "pods", compatible with its smartphone-enabled battery system. Pods often feature rare varieties of full-spectrum cannabis oil. Products featuring East Fork: Vaporizer "pods"
Laurie + MaryJane is the namesake kitchen of prolific cannabis chefs and authors Laurie and Mary Wolf. In addition to a full line of infused edibles, L+MJ makes a delicious trail bar to enhance your active lifestyle. Echo Electuary combines honey harvested from their in-house apiaries with cannabis harvested from Oregon's most sustainable farms, resulting in infused sweets that are hard to match. Nu produces a line of tinctures, gel caps and full-spectrum oils. Available in various CBD:THC ratios, Nu's products are precisely formulated for consistency and clarity by the talented Sweet Cannabis lab team. Grön Chocolates produces a full line of high-end chocolate treats at its Portland confectionery paradise. Look for CBD-dominant and 1:1 options available all across Oregon. Danodan uses a slow, solventless concentration method that captures the full spectrum of cannabis in its lineup of caramels and glycerine tinctures. CBD Apothecary expertly crafts strain-specific, true-to-the-plant products focused on health and wellness. Mirth Provisions crafts a popular line of sparkling infused beverages, available in different CBD:THC ratios and delicious flavors, including Lemon Ginger and Rainier Cherry. Periodic Edibles makes a line of rich, well-formulated caramels. Periodic infuses butter (and coconut oil for a vegan option) with a precise blend of East Fork house cultivars, creating luxurious treats that are 100% solvent-free. Critical Source crafts the incredibly tasty Kalapooya Fire line of vaporizer cartridges. Through their meticulous processing, Critical Source's lab team consistently nails subtle terroir notes often not seen in CO2 oil.